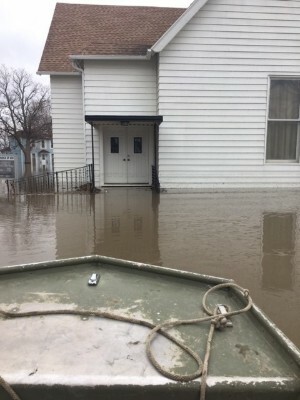 On March 20, the levee holding back the steadily rising Missouri River broke in more than one place, forcing the town of Craig, Missouri, to evacuate, and leaving behind flooded homes and churches—including First Church of God. Inside the house of worship, chest-deep water inundated parts of the facility, while two feet of water was visible inside the sanctuary, damaging carpets, pews, books, tables, and their piano and organ. With homes underwater, at least two members of the small congregation have also had to find temporary shelter. The river has receded somewhat but, with more snowmelt and rain in the forecast, it’s not certain Craig will dry out. 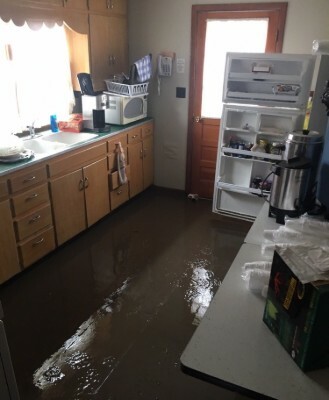 In the meantime, First Church of God finds itself in a difficult situation—without flood insurance, as this kind of flooding had never happened before. One of the church’s key lay leaders (the church is currently without a senior pastor) told Howard Megill, state pastor for Missouri Ministries of the Church of God, “I’ve never seen water in town, nor in the sanctuary, like this in my lifetime.” The Red Cross has been on the scene, providing water and food to meet immediate needs. Of course, the structural damage could be a nightmare to repair, especially without flood insurance. Until this nightmare is over, which could be several weeks—if not months—the congregation has found a temporary place to gather at a community chapel on higher ground. All the while, water is still flowing through the streets of Craig, creating an other-worldly sight and a growing headache for residents and relief workers. 1. Pray for First Church of God and the community of Craig, not only now, but in the coming weeks and months. 2. Pray for opportunities for the local church to reach and bless their community in the midst of crisis. 3. Consider organizing a work team to help at the church and/or in town. Carpeting and portions of walls—at minimum—will need to be replaced. Contact Missouri Ministries at https://cogamo.org/contact for more information. 4. Donate generously to Disaster Relief, remembering that the church did not have flood insurance. 100-percent of your gift will support disaster relief in Craig, Missouri, when you designate it accordingly. Donate online at www.jesusisthesubject.org/disaster-relief and be sure to answer the question, “Would you like to include a note to Church of God Ministries or a missionary with your contribution?” by checking the box and filling in the Note field with “Missouri Disaster Relief #45.04502.” Or, mail your donation to Church of God Ministries and write “Missouri Disaster Relief #45.04502” on the memo line of your check. One hundred percent of your designated gift will be remitted to assist in this ongoing disaster. This entry was posted in All Church of God, Disaster Relief and tagged aid, Craig, crisis, damage, disaster, Disaster Relief, Disaster Relief Committee, Disaster Relief Team, DRC, First Church of God, flood, flooding, Howard Megill, humanitarian, levee, Missouri, Missouri Ministries of the Church of God, Missouri River, MO, rain, snow melt, snowmelt, storms, weather. Bookmark the permalink.